When your Mojo is MIA, a challenge or a sketch is often just the thing to kick-start your creativity, and CSI is one of my favourites. 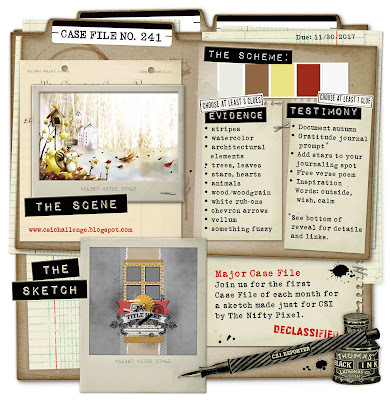 The Major Case File comes out of the 1st of every month, includes a sketch, and you have until the end of the month to complete it and link up, share your page and be in with a chance of winning a fab prize. There is a new twist beginning this month, where you can choose to investigate the Scene for yourself and draw your own inspiration from the image. I like the traditional clues though, as shown above - use all the colours in the Scheme, at least three pieces of evidence and one from the testimony list. The Scheme: all five colours are there, plus a tiny touch of leaf green, neutral browns and gold. Testimony: this is a picture of my son Tom. My journaling is a bit personal to share in detail here, but I was inspired by the word "wish" and on the back I have written down some of the things I wish for him - the main thing being that I wish that he could learn to love himself as much as we all do. I had great fun doing the "watercolour" part of this challenge to create a background for my page. In fact I loved it so much that I took a picture just before I started covering it up again! Well I feel I have my mojo back, just need lots of practice now to get back into the groove!! WOYWW #442 - Wonderful Wells! It's a beautiful day again here in Norfolk UK, crisp and sunshiney. I'm writing this ready for tomorrow when, whatever the weather, it will be time for What's On Your Workdesk Wednesday. 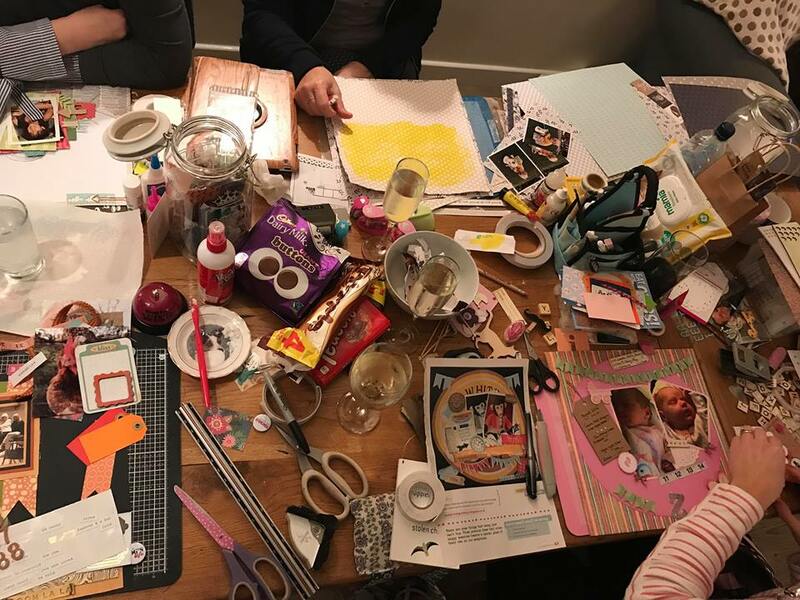 Hop on over to Julia's Stamping Ground if you would like to join in. 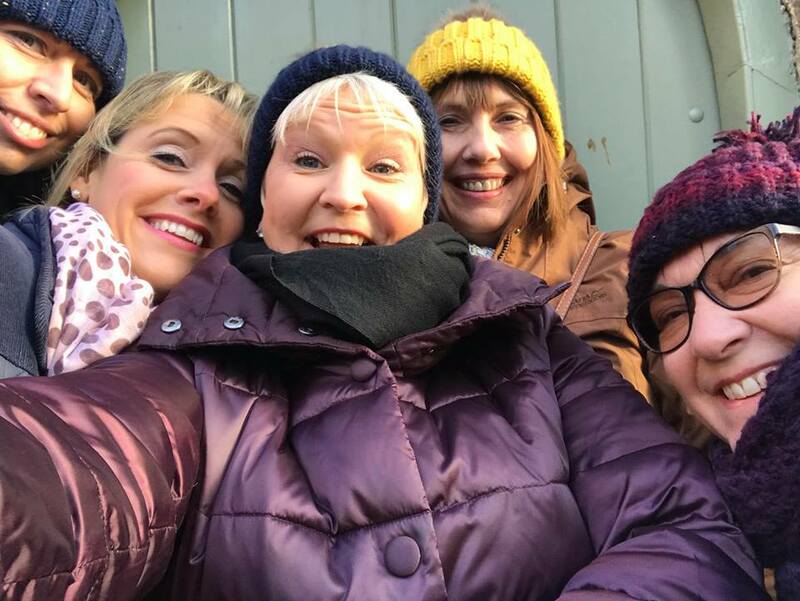 L-R: Karen, Mel, Emma, Trina and Moi. We stayed in a gorgeous house called Regal Cottage which was just a stroll away from the beautiful beach, fab shops, fish'n'chips on the quayside and the Golden Fleece where we had the most delicious Sunday lunch. Thanks for visiting me today, see you at Julia's! 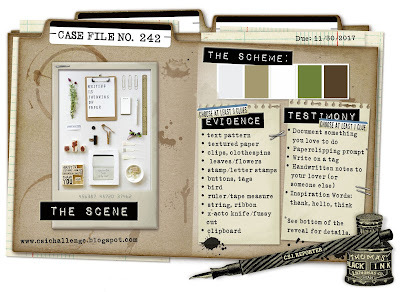 CSI Case File #242 - Love This! It's been a while since I've had time to join in with regular scrapping challenges, but CSI is still one of my favourites. There is a new twist starting this month, where you can choose either to investigate the scene yourself and draw your own inspiration, or follow the traditional clues to solve the case. Here's Case File #242 ..
Scheme: all five colours included. Testimony: I bottled out of handwriting straight on to my page, so wrote it on the back instead. "This photograph was taken from our front door, after I'd walked home from work at the hospital early because of the snow. The whole world was muffled and quiet and put me in mind of the saying 'there's nothing so quiet as softly falling snow'. It was a wonderful feeling to close the door to our cosy cottage, shutting out the world outside." Thanks for visiting my blog today and see you again soon! The photo shows Yours Truly almost 30 years ago (I had to double-check that, it really doesn't seem that long!!) on holiday on one of the beautiful Greek Islands. 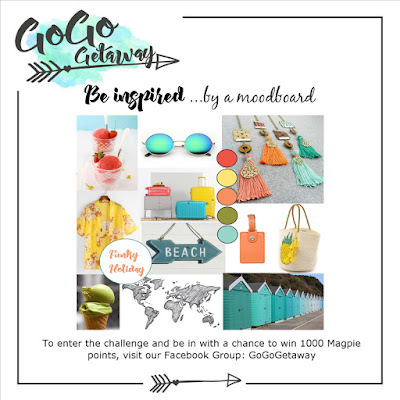 There was so much inspiration to be taken from this mood board - for my page, I used the holiday theme, the juicy colour scheme, the arrow, map, beach huts, pineapple and of course those tassels! Several of the embellishments came from the Challenge Jar my lovely friend Emma gave me on our Seaside Scrapbooking weekend in Wells - the paint sample strip, the acetate overlay, the paperclip and the "remember" word magnet. Thanks for popping in to see me today, see you again soon! After opening the envelopes out flat, I used my WRMK Envelope Board to cut and score them (you could make them without the board, but it does make life a lot easier!). Some I turned inside out as I like the look of the printing. Hope you're all enjoying a happy and creative week out there. My friend Trina and I recently went on a trip to Ally Pally to see one of those giant arts and crafts shows and we had wonderful time. We bought loads of stuff we really really needed and got to do some "make-n-takes" as well. One of these was at the PaperArtsy stand, where we tried out several stamps and had a go at colouring them with Distress Oxides. I didn't buy the stamps - only because I'd already bought several other sets of stamps by that stage - but I did buy three colours of Distress Oxide, which I used to create the backgrounds for these. I cut the solid shapes out and mounted them on foam pads for dimension, adding the scribbly lines back in by hand with a Micron pen. Final touch was a subtle shimmer with my Wink of Stella pen - doesn't show in the pics really, but looks fab IRL. Anyway, if you would like to show the world YOUR workdesk, or just have a nosey at other creative spaces all over the world, just pop over to Julia's, everyone is welcome. See you there! Another beautiful though chilly Autumnal day beginning here in Norfolk UK and I have a fun day out with my good friend Trina to look forward to. For this page, I used a combination of printable collage sheets from Crowabout StudioB which I bought from Mischief Circus, pieces cut from magazines, and some of my stash of alphas. Chasing my Mojo and Catching Up! It's been a strange few weeks for me and not much at all going on at the ArtyFarty Front - due to a combination of lack of time, lack of energy and a Missing Mojo. All is not right with my world if I'm not doing a bit of something creative every day, so it's been a bit weird. It was a bit of a battle, I couldn't get it to come out "right" at all and it's NOTHING like Azoline's beautiful, whimsical piece, but hey, at least I had a go and it was fun to play with the inks on this strange shiny not-paper stuff.